Let’s face it: brands are dead—and that’s terrible news for the 4 household names (and their landlords) we need to talk about today. Research from Scott Galloway, founder of digital-research firm L2, tells the tale. Galloway looked at the 13 S&P 500 stocks that have beaten the market for five straight years and found something shocking: just one, Under Armour (UA), is a consumer brand. And as Galloway points out, there’s no way UA will keep that run going. The other 12 names on the list are mostly innovators that have sliced into old-school businesses and flipped them on their heads—think Facebook (FB), Salesforce.com (CRM) and, of course, Amazon.com (AMZN). What I am saying is that you’ll save yourself a lot of agony if you dump the 4 companies below, all of which are either leaning hard on over-the-hill banners or are sitting ducks for Jeff Bezos and company. Procter & Gamble (PG) owns dozens of brands, including Gillette: at 115 years, the razor name is one of the oldest brands there is. That, plus millions of dollars of print and TV advertising, has prompted generations of men to grab their Gillette razors every morning without a second thought. But in today’s world, where folks make decisions on a tweet or an online review, those millions of dollars suddenly mean zero. Because the moment upstarts like Harry’s and Dollar Shave Club showed up, Gillette started bleeding market share (for six years and counting!). Cornered, it slashed its prices by up to 20% last April. That’s a problem ricocheting throughout P&G, which has only reported revenue growth in four of the last 20 quarters! But you wouldn’t know by looking at earnings per share (EPS), which jumped 19% in its fiscal fourth quarter (ended June 30), even though revenue was flat. And make no mistake, this payout will remain under pressure: P&G forked out 77% of free cash flow as dividends in the last 12 months, the highest level in 17 years! 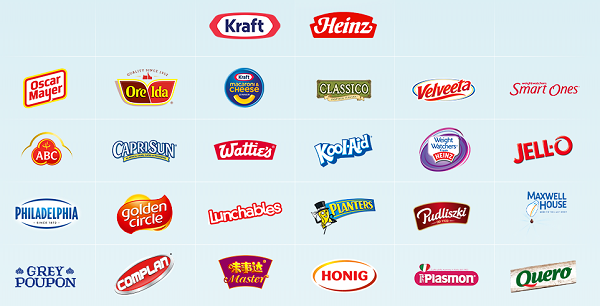 Kraft-Heinz (KHC): Last week I gave you three big-food stocks that are on the wrong side of consumer tastes. You can add Kraft-Heinz to that list. No wonder the consumer-staples giant is showing the same pattern we see again and again in the industry: rising earnings supported entirely by cost cuts—while nimble local food producers lure away customers. In the second quarter, Kraft-Heinz’s sales dipped 1.7% while adjusted EPS soared 15%. The most worrying sign? A number few folks care to look at: dividends as a percentage of free cash flow (or operating cash flow minus capital expenditures). 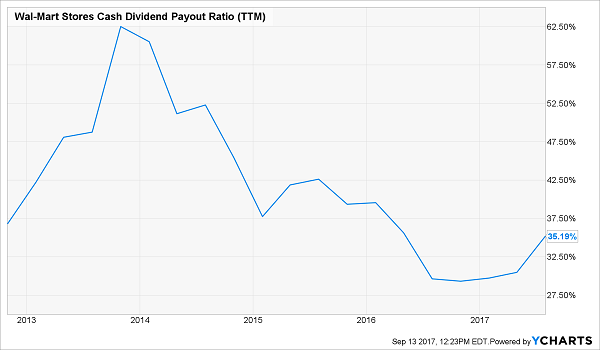 In the last 12 months, Kraft-Heinz paid out 142% of FCF as dividends, much more than it brought in! Amazon’s purchase of Whole Foods—and its price slashing at the chain—is also a headache for KHC, because it means more cheaper, healthier products out there to tempt folks away from its preservative-stuffed packaged lineup. Sure, Berkshire Hathaway (BRK.B) is a major shareholder, with a 27% stake, but that’s not enough to offset Kraft-Heinz’s weak growth prospects, ho-hum 3% dividend yield, middling dividend growth and nosebleed P/E ratio of 26.3. The media was all over the 60% growth in online sales in the Wal-Mart (WMT) second-quarter earnings report on August 17. Overall, the chain’s sales gained 2.1%, while adjusted EPS nudged up a little less than 1%. 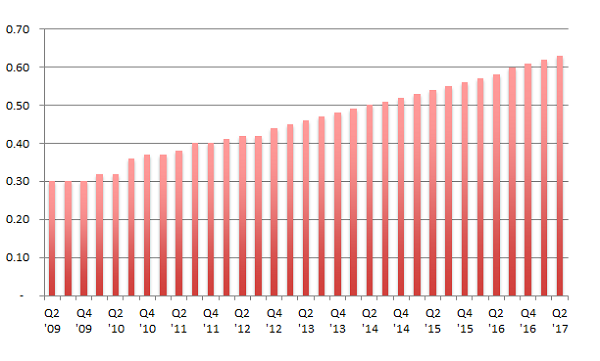 Here’s the problem: Amazon still has a stranglehold on online retail, with a 76% share, according to Wired. Meantime, the latest earnings report brought another concern: lower margins as Wal-Mart pours cash into e-commerce and slashes prices in a futile bid to close the gap. What galls me most about Wal-Mart is its stingy dividend, which has been rising by just a penny a year since 2013. Management could easily do more, with the payout eating up just 48% of earnings and 35% of FCF. Those piddling payouts put a brake on the stock’s upside, which is already strained by its P/E ratio of 19.2, way above its five-year average of 15.4. There are far better deals elsewhere, like in the 8.5% dividend payer I’ll tell you about at the very end of this article. 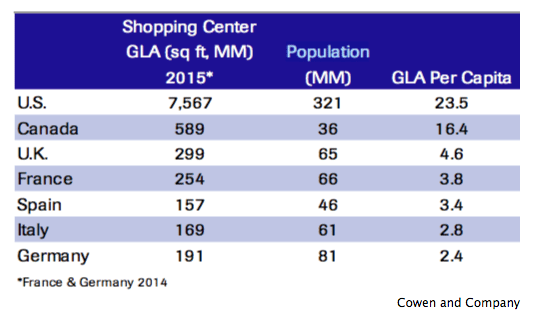 When it comes to retail REITs, one fact stands out: America is awash in malls. In fact, we’re sitting on more gross leasable shopping area per person than any other developed country! This comes as more sales shift online, brick-and-mortar retailers like Sears Holdings (SHLD) race to shutter stores and consumers spend more on experiences and less on stuff. That doesn’t mean the death of the mall is upon us, but it does mean I’m staying away from retail REITs, particularly marginal players like DDR Corp. (DDR), owner of 298 shopping centers across the country. The stock pays a sky-high 7.4% dividend, but that’s a sign of risk, not fatter payouts: the stock has cratered 25% this year! 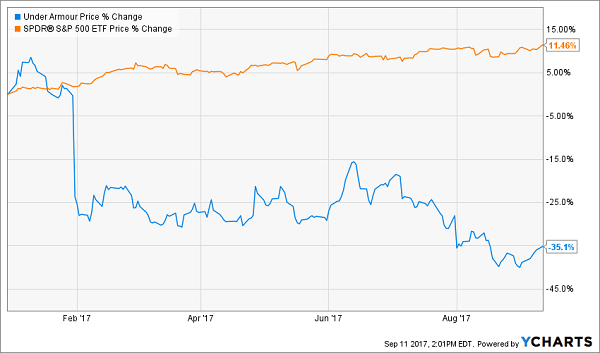 The dividend is well covered, at 66% of trailing-twelve-month funds from operations (FFO, the REIT equivalent of EPS), but there are plenty of warning signs that should make you very hesitant about investing in DDR right now. Why? Because growth packed its bags and moved out! DDR’s FFO has been stuck at $0.30 for three of the last four quarters, and FFO actually fell 10%, from $0.33 year-over-year in the latest quarter. Meantime, occupancy has been sliding, coming in at 93.7% in Q2, down from 96.1% a year ago, and the company expects it to nudge lower still, to between 93.0% and 93.5% for the full year. Finally, at $4.7 billion, DDR’s long-term debt is 30% higher than its $3.6-billion market cap! That’s a huge weight to carry as interest rates head higher—and Amazon continues to circle. 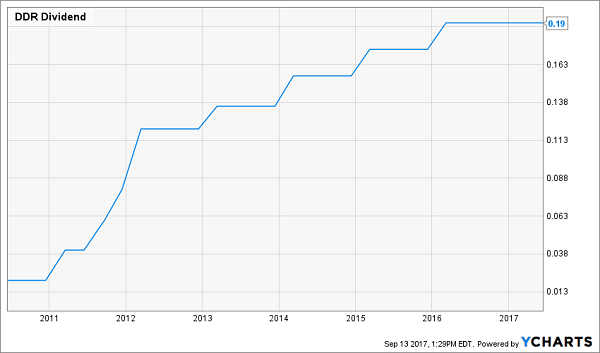 Alert: This Cheap 8.5% Dividend Won’t Last! My top REIT buy now recently hiked its dividend again—by 4% over last quarter’s payout. 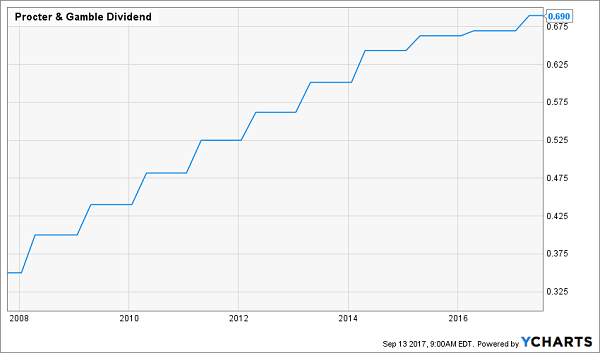 That marks this income wonder’s 20th consecutive quarterly dividend hike! It pays an 8.1% yield today—but that leaps to an 8.5% forward yield when you consider we’ll see 4 MORE dividend increases in the next year. And the stock is trading for less than 10-times funds from operations. Cheap! However I expect its valuation and stock price to spike 20% over the next 12 months as more money stampedes into its REIT sector (and no, I’m NOT talking about a retail REIT here). That makes NOW the time to buy and lock in that 8.5% payout! Now I’m ready to share all the profitable details on this off-the radar (for now) REIT with you. I’ll also take the wraps off my No. 2 pick—a 7.6% payer backed by an unstoppable trend that will deliver growing dividends for the next 30 years! Don’t miss your chance to grab these 2 income wonders before their share prices run away from us, driving their fat dividend yields lower in the process. All you have to do is CLICK HERE and I’ll give you their names, tickers, buy prices and my complete REIT investing strategy now.